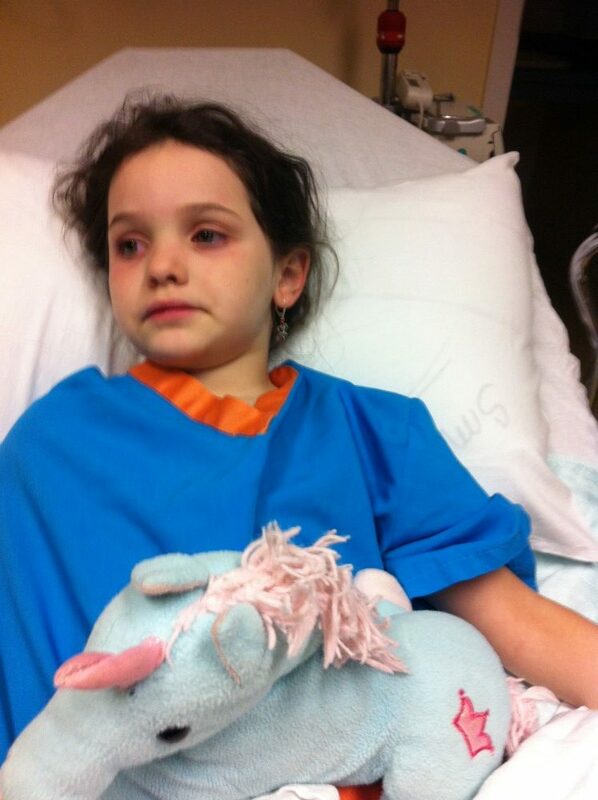 On November 30th, 2015 our daughter woke up with a high fever and mysterious rash, after the first 24 hours of sickness we took her to our family physician and we were told it might be strep or scarlet fever. A swab was taken and a day later it came back negative. By day 3 of high fever and rash the vomitting started. On Day 4 we took her to our local children’s hospital as she had been vomitting for well over 24 hours non stop. They told us is was just a bad virus treated her with some anti nausea meds and home we went again, day 5 the fever was still high but she seemed to be doing a little better and ate a few bits of ham dinner that night. On day 6 she had the high fever and her eyes started changing colours and some small peeling was starting on her hand but she ate a little more that day so we thought she might be getting better, it wasn’t until our friend, whose child had Kawasaki disease 10 years prior, came to see her and told us she looked just like her daughter did the days leading to her diagnosis. Minutes after the visit was over our daughter started vomitting again so we took her in, at 8:30pm,hoping the emergency was quiet that night. She was seen almost right away after triage and we landed on a wonderful doctor who left no stone unturned, she ran all the test and X-rays she could think of but even before runing the test she thought our daughter looked like a Kawasaki kid. By the wee hours of day 7 our daughter was officially diagnosed with typical Kawasaki by the on call rheumatologist and IVIG, remicade and high dose of ASA therapy was order along with a whole new set of test which included ECG and ECHO. Those sadly revealed 3 medium aneurysm. After a week at the hospital we thought things were looking up, sadly at the post diagnosed check up a few days later things looked pretty bad a new aneurysm was discovered and the original 3 had grown to large size so we stayed for the weekend to receive a second IVIG and ASA treatment. Then on December 23, 17 days post diagnosis, the fever came back called the on call rheumatologist who asked to see her in the emergency room ASAP where it was discovered Her heart rate, blood pressure, white blood cells, crp and esr were all uncontrolled and elevated, they called it a 3rd flare up of Kawasaki they changed treatment course and gave her remicade only this time and high level of steroids they also added a blood thinner since once again the aneurysm had grown from the last time. We went home on Christmas Day afternoon hoping this would be the last treatment she would received. Sadly we were back in on December 30th once again with a high fever. By then our rheumatologist had been in talks with specialist from all over the world trying to save our child who by this point has 5 large aneurysms and was in the process of a 4th flare up of this disease. The experts call up with a new treatment course which includes a drug called cyclosporine. We were once again released after 17 days stay this time. We are now 8 mos into treatment and her crp and esr levels are still elevated, we have weekly and monthly blood work and countless appointment and including an angio-cath scope coming up soon. We are told Kawasaki is still active in her system but the drugs are keeping the flare ups from happening and slowly the inflammation levels a going back down. She is still sick, although you wouldn’t know if you had just met her, the outside doesn’t reflect the inside. This has been the longest, hardest and most stressful 8 months of our life. We are on edge everything her temp is .1 out of the ordinary. Her older brother has nightmare of losing his sister and we struggle to come to terms with our new ” normal”. But kids are amazing little creature, they adept to things adults would scream and get angry about, kids just take it as it comes. She still aches and fatigues easy, she is still limited due to her meds and heart but she tries to do as much as she can and at this point we are learning to appreciate every little victory even if the last only a moment, we cherish them!